Multiplication is always a problem for kids and perhaps for their guardian and teachers as well. 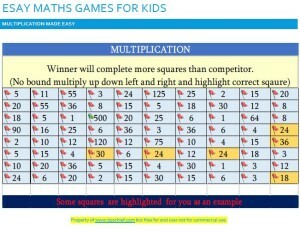 Here Easy maths multiplication games for kids to learn multiplication. it has simple rule just multiply up, down and left right to reach the correct answers. Moreover, It is a sample you can also make it on excel sheet for your kids. Teachers and parents must give their feedback. Here an easy way for multiplication is given. 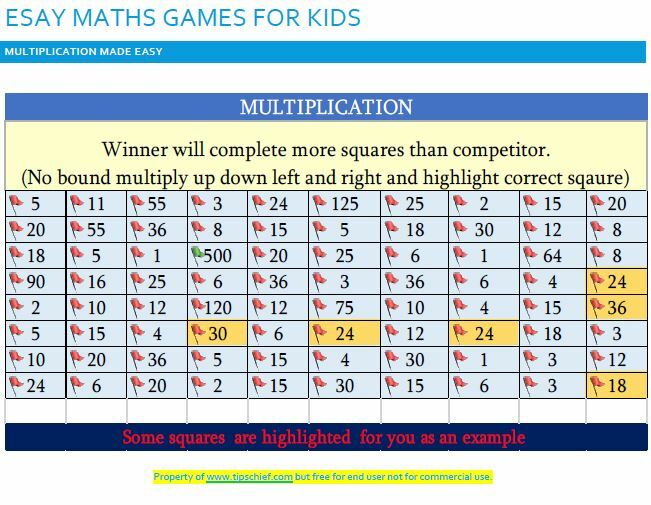 An excel sheet with multiplication tips for kids are given. You can also prepare your own sheet as well. Image as well as soft copy in pdf format is available for this exercise. Once your students/kids get used of it, let us tell us we will upload such more exercises. We hope this will be helpful for you. As shown it is a simple sheet. Just ask your student to multiply any of two numbers and find its result. Students have to encircle the correct result. If you are using computer you may bold the correct result. Give marks for each correct result. Students may feel difficulty at first, however practice makes them perfect.